It's a fight for the oranges, jelly and hummingbird food! 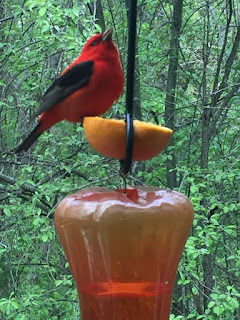 All of the Tanagers and Orioles are competing for position on the feeders! The male scarlet tanager in spring plumage ranks among the most stunningly beautiful birds in North America. One glance at his neon-bight plumage can turn even the most disinterested person into a confirmed bird watcher. Oddly, this dazzling bird’s song has been compared to”a robin with a bad cold” A distinctive chick-burr call is often the first clue of a scarlet tanager. As I am writing this I am hearing the drink your tea of a towhee back in the woods here, at Songbird Prairie Inn and Spa. The male scarlet tanager in spring plumage has a solid-red-body and jet black wings and tail with a black-button eye and bone-gray bill. The female is dull olive above with dark wings and pale yellow underparts. Immature’s resemble females, and in late summer the adult males take on the muted olive-yellow plumage. In all plumage’s, the scarlet tanager’s wings are darker than those of the summer tanager. At just 7 inches long, scarlet tanagers are the smallest of the four North American tanager species. Preferring deciduous forests with oaks, maples, and beeches, scarlet tanagers generally inhabit areas farther north. They arrive in April or May and depart by mid autumn. Flocks of early migrants are sometimes decimated by sudden late spring snowfalls or ice storms which cause them to starve or freeze to death. Sometimes being the early bird is not such a good idea. Basically insectivorous, the scarlet tanager moves quietly about in the upper canopy of deciduous trees in searching of prey. Small summer fruits, such as blueberries and mulberries are also taken as are fall staples such as poison ivy berries and sumac fruits. Scarlet tanagers occasionally engage in fly catching, or hovering behavior to obtain food. Early or late in the season, cold weather may force them to the ground for forage for bugs in sheltered microhabitats. Typically the scarlet tanager nests in a large, unbroken, wooded tract and high in a deciduous tree often but not always an oak. It will be situated well out from the trunk on a horizontal limb. Made by the female alone, it is shallow and loosely constructed of twigs, rootlets, weeds, and other plant material. Three to five eggs are laid and the female incubates them for up to two weeks until hatching. Both parents feed the young during the 9-14 day nestling period and for two weeks more after fledging. 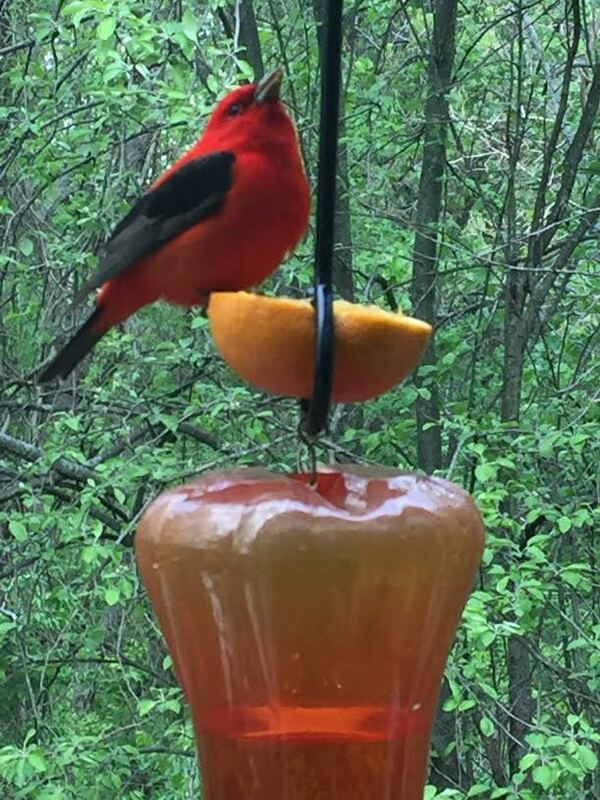 Scarlet tanagers are not common at bird feeders, Except here at Songbird Prairie Inn and Spa! ;but they do on occasion-respond to offerings of bread, doughnuts, orange halves, or a peanut butter, cornmeal mixture. They will also eat small fruits and in fall migration may be a regular sight along tangled hedgerows overrun by poison ivy or mulitflora rose which is so abundant here at Songbird Prairie.